Does Pikmin Belong in the Video Game Canon? Let me start by being honest with everyone: I never finished Pikmin. At least, I didn’t finish the game on my first playthrough when it was first released in 2001. As a kid, I was too scared to let any of my Pikmin die, which either led to me not being able to beat certain parts of the game or not being efficient enough to complete the game within the time limit. I can’t begin to count the number of times I turned off my GameCube when my Pikmin were being eaten alive, or when I reached the end of a day in the game without accomplishing enough. Safe to say, I wasn’t the best gamer back in the day. However, a sequel to the game, Pikmin 2, was released in 2004. For some reason, I looked back fondly on my experience with Pikmin 1 and decided to play the sequel, and I immediately fell in love with it. This encouraged me to return to the challenge of Pikmin 1, and I’m forever glad I did! 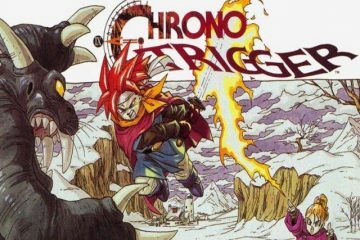 To me, the game has an amazing blend of innovative gameplay with the right amount of challenge and quirkiness. The general Pikmin interface showing the numbers of Pikmin active, and the time of day. Pikmin was released as an early game for the Nintendo GameCube. The game was meant to showcase some of the console’s new abilities to generate beautiful images and handle many characters on the screen at one time. It sold a modest 1.2 million copies, which is good considering the generally limited success of the GameCube. As I mentioned, Pikmin 2 was released three years later, and the long-awaited Pikmin 3 was released in 2013 for the Wii U—perhaps one of the few titles that actually made use of the gamepad. 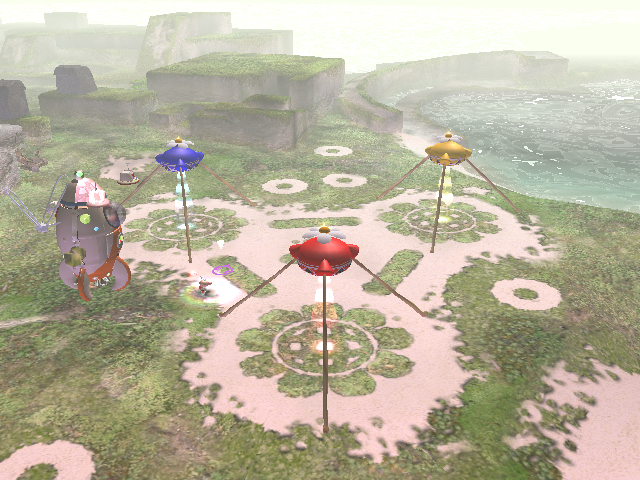 Pikmin represented a new area for Nintendo in the form of a real-time strategy game. The game brought familiar elements—managing many characters in different areas all at the same time; collecting and managing different resources—but all with a “Nintendo” twist. This theme of familiarity mixed with new and strange ideas is what really makes Pikmin shine as a game. The premise of Pikmin is fairly simple. Olimar, from the planet Hocotate, is the captain of a spaceship named the SS Dolphin. His ship is hit by a meteor, and he crash-lands on a foreign planet, which is later named ‘PNF-404’ in Pikmin 3. Olimar looks in shock and disbelief at his fallen spaceship. On this planet, Olimar meets Pikmin, whom he uses to help retrieve his 30 ship parts, 25 of which are necessary to escape the planet, and he must accomplish his goal within 30 in-game days (each of which is 12 minutes of real time). Olimar has limited time because he is unable to survive in the ‘toxic’ oxygen-rich atmosphere. Along the way, Olimar encounters Pikmin of various types, each with a different ability—such as red Pikmin who are impervious to fire, or blue Pikmin who can swim. 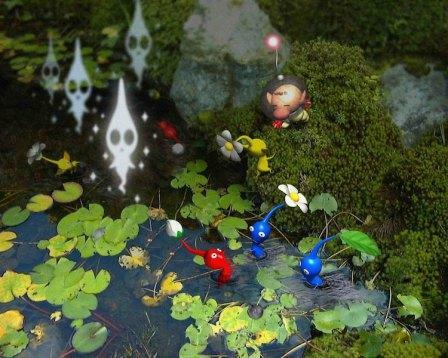 Pikmin are both cute and deadly. Quite the array of baddies. The ominous area in The Forest Navel where Olimar and the Pikmin land. Pikmin does a fantastic job of throwing the player into seemingly recognizable situations, but with a twist. Olimar crash lands onto a planet that seems very Earth-like, which is hinted immediately when the player must use the Pikmin at the beginning of the game to push a cardboard box out of the way. The flora and fauna of the planet features familiar looking plants and terrain, but not everything is what it seems. 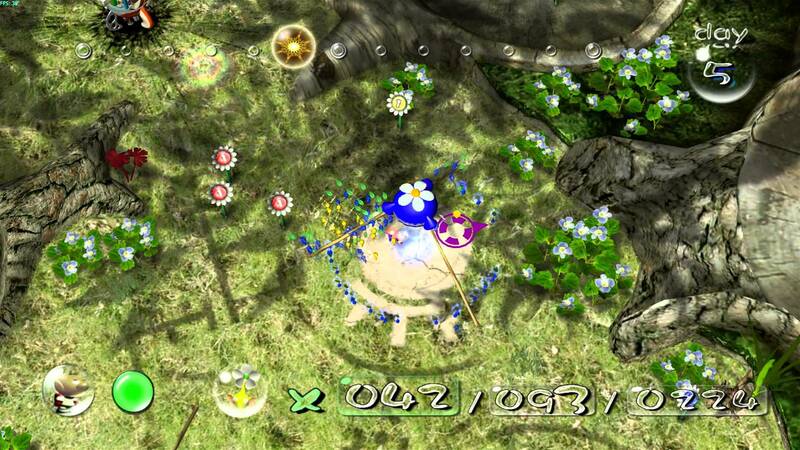 For example, Pikmin may stumble onto a patch of grass that they decide to begin plucking; suddenly, a strange nectar can appear from the grass, which the Pikmin will drink, causing the characteristic leaf on their head to turn into a flower. Enemies are just as familiar-yet-strange. 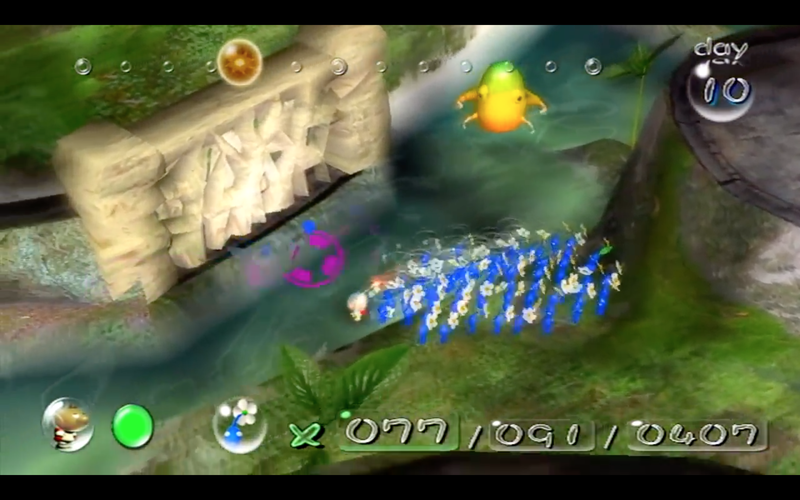 One of the enemies you’ll encounter is a frog, but the frogs are able to jump high into the air and float briefly white waiting to crush your Pikmin. You’ll also face a large beetle, which suddenly starts shooting rocks at your Pikmin to squish them in a strangely mechanical fashion. It is this aspect of toying with the player’s sense of comfort that makes the characters and the world so engrossing. Flying frog about to ruin Olimar’s day. Olimar himself is experiencing this world for the first time, too, and making observations along the way. 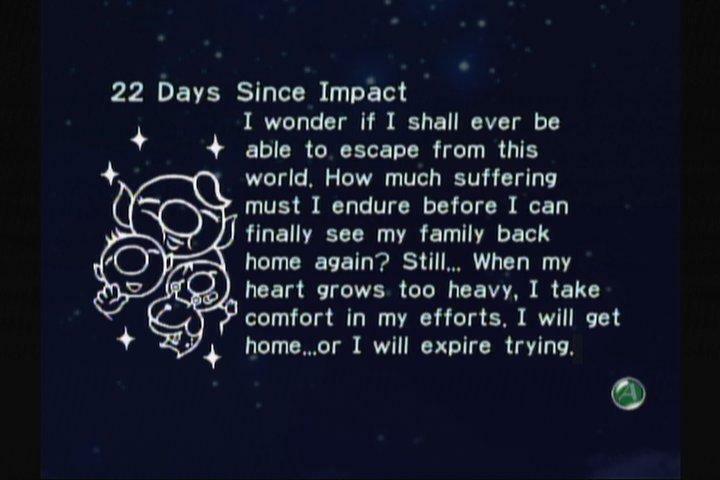 His stream-of-consciousness is shown to the player as he finds new Pikmin or tools; and, at the end of every day, Olimar writes an entry into his “Voyage Log.” In this log, he recounts his daily experiences with the Pikmin, and often these experiences might match those of the player since both are observing this new world simultaneously. 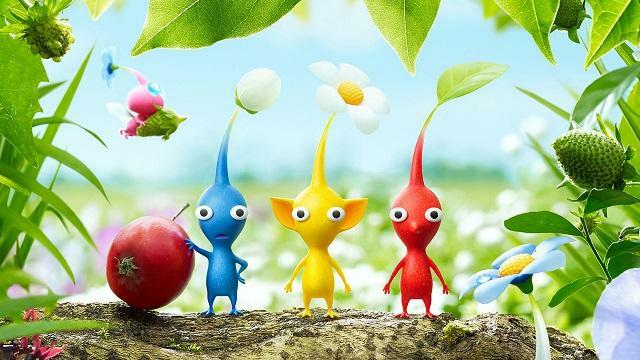 When I see the Pikmin engaged in fierce battle with other creatures of this world, I often grow uneasy wondering why they never attack me… Could it be that they actually view me as a parental figure? I recall having similar feelings during the beginning of the game, watching the Pikmin destroy enemies and traps even though they seemed so sweet. 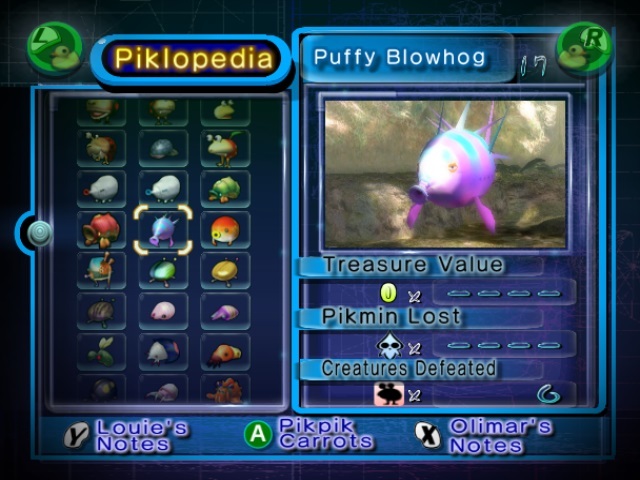 There is, in fact, one enemy, called the “Puffstool,” which releases a gas that turns your Pikmin purple and causes them to attack Olimar. That’s a truly terrifying experience. Olimar’s Voyage Log, complete with both fun text and illustrations! The Voyage Log also serves as a diary for Olimar. He writes entries about longing for his family, or his horror at seeing Pikmin die in battle. One of the more serious messages in his log reads: “When my heart grows too heavy, I take comfort in my efforts. I will get home…or I will expire trying.” That’s a serious message from a game that, on the surface, seems fairly lighthearted. These and other messages show that Olimar, despite being an alien, is awfully human. When I first played Pikmin, these ominous messages were part of what kept me feeling uneasy and nervous, ultimately leaving me unable to finish the game. For crying out loud: when your Pikmin die, you see them transubstantiate into ghosts, as if to remind you of the wrongs you’ve committed. Look at what you’ve done, Olimar! Although the premise of Pikmin is simple, helping Olimar travel across the planet to collect his spaceship parts is not a simple task. There are a variety of enemies and different terrains that force the player to explore and test out ideas. One example of this is an enemy called the “Breadbug,” which takes away animal carcasses and other goodies, hiding them in its nest where the items disappear forever. The humble Breadbug. Clever name, Nintendo. 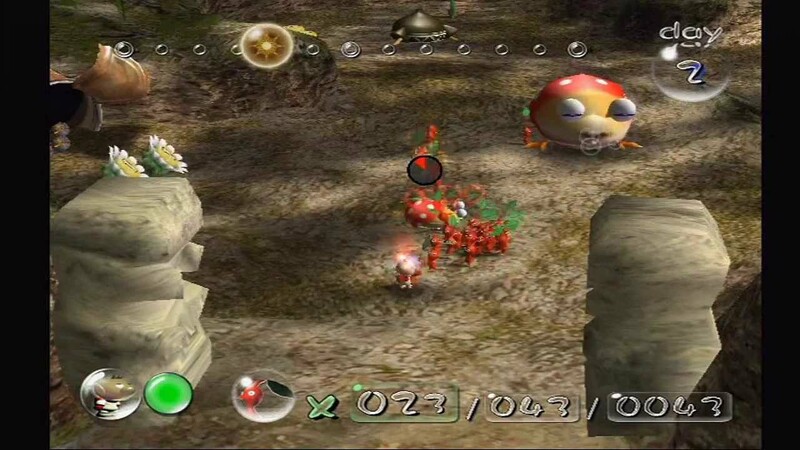 The player has likely learned to swarm their Pikmin around enemies, but to defeat the Breadbug Olimar must add enough Pikmin to carry an item so that they overpower the bug. The Breadbug gets hit in the face and dies when the item it’s holding onto is zapped into the Pikmin’s onion. The ship parts themselves are scattered throughout the different areas. Some parts may just be sitting out in the open, while others are contained within enemies. The player will often need to return to certain areas to get previously unattainable ship parts, often to be surprised that this old area, with which they were once so familiar, has a few new enemies or other creatures lying around. Olimar fighting some of the most common enemies: Bulborbs. 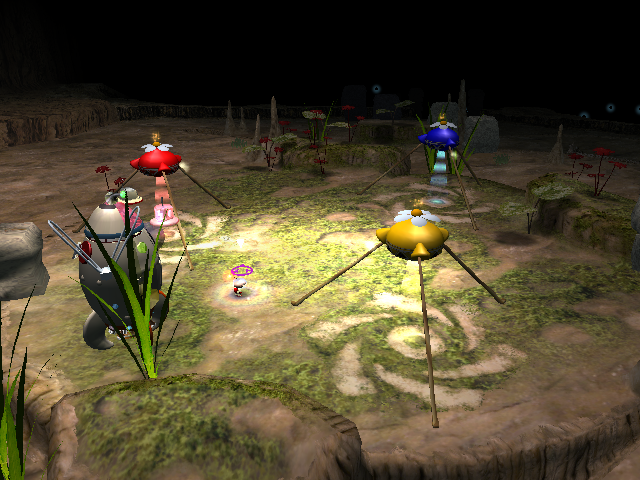 Since Pikmin is a form of real-time strategy game, the player needs to manage hordes of Pikmin at once. But the beauty of the game is that there are many different ways to play: you can choose to be timid and fight only the necessary warthogs and occasional beetles, or you can just spend time growing an army of Pikmin. The game truly involves exploration because the player has the freedom to craft their own experience within the game. This malleable gameplay is complemented by beautiful and detailed scenery. The enemies are varied and vibrant, and the areas in the game range from the peaceful “Forest of Hope” to the dark and ominous “Forest Navel.” The music perfectly blends into the background and matches the scenery and gameplay. My favorite song would have to be the theme for “The Distant Spring,” which starts off peacefully but almost nebulously, as if you’ve seen something through a patch of fog. The music gradually gets louder, which matches the gameplay: the minute the player leaves the landing site, there are armies of frogs and Bulborbs (a weird, spotted creature that is practically a walking mouth). The peaceful opening to the Distant Spring just helps to mask its horrors. If, like me, you played Pikmin as a child, you’ll know that there are a lot of terrifying experiences in the game. These range from the strange and new enemies that are continuously trying to destroy your Pikmin to the ever-looming limit on Olimar’s life. However, Pikmin cleverly mixes these challenges with beautiful scenery and a quirkiness that encourages the player to keep exploring. There is just enough brightness and Earth-like familiarity that you can keep going, perhaps just as Olimar can persevere to reassemble his ship in this strange land. Pikmin broached a new genre for Nintendo, but it was clearly a success given that several sequels have been made to elaborate on this original experiment. Pikmin 2, for example, eliminated the time limit from the original game and added in caves full of treasures for Olimar and company to collect. 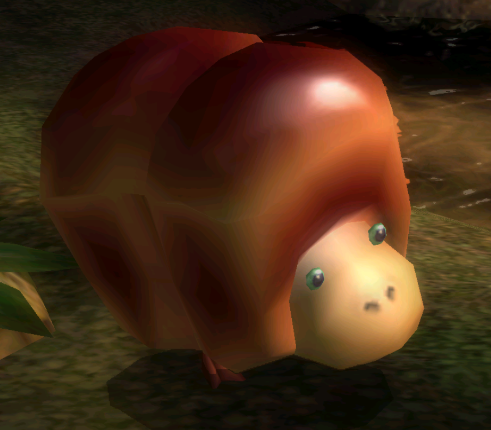 Pikmin 2 was particularly formative for development the series, since it formalized the ideas of an explorer logging their observations about a new world as Olimar did in his “Voyage Log.” This manifested in the sequel’s “Piklopedia,” a running journal of all plant and animal life encountered on the planet PNF-404. This journal went so far as to create scientific names for every creature, and connect them all into some Pikmin phylogenetic tree. I point this out because it shows that the original game created such a fascination with its world that the developers decided to catalog all of the information and make it readily available to the players. I, personally, spent more time than a person should throwing carrots at enemies in the Piklopedia to watch them eat or attack. 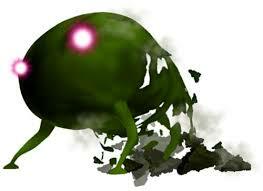 Even when I return to the game today, there is still one thing I fear in Pikmin: the Smoky Progg. Seriously, what IS that thing? This is an optional boss in the game that only appears in the Distant Spring on or before the 15th day—which means that, every time I try to beat the game efficiently, I encounter this monstrosity. The Smoky Progg is walking ball of poison with glowing eyes that is born out of a harmless egg. Most of the time, when you throw Pikmin at it, they just die. And the worst thing is: the guy just stands around your home base and waits for you to bring the Pikmin back their onions. Your base is where you’re supposed to feel safe, especially since you can quickly hide Pikmin in their onions or assemble an army to fight an enemy. 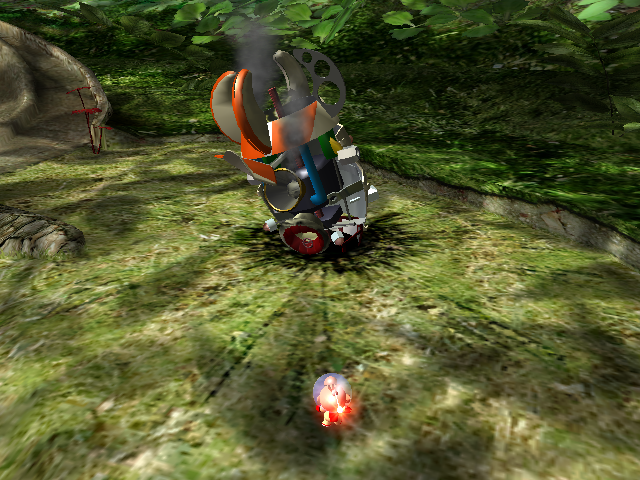 But the Smoky Progg destroys this sense of safety, forcing the player to face a new and daunting challenge. What’s more, for first time players, the encounter with this creature will often come as a surprise. Olimar may be out and about while having groups of Pikmin carry ship parts or other items back to their base, and then suddenly see that their Pikmin count is dropping—even though they were sure that the path for the Pikmin was clear. When you return to see what the problem is, you’re face-to-face with a new and terrifying monster. 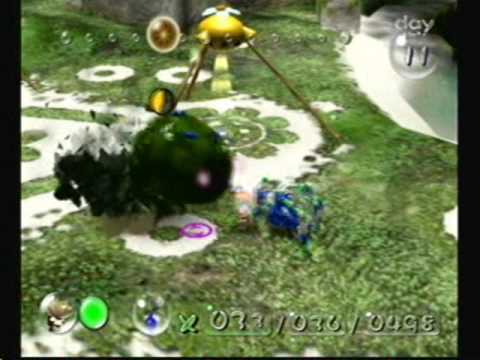 The player is conditioned to throw Pikmin on top of the enemy in order to take it down, but they find that this doesn’t exactly work with the Smoky Progg, since Pikmin thrown on its back will just die from the poison. I remember being in such a panic when I first stumbled upon this horror. Somehow, this game is still able to strike fear in me even after I’ve played it so many times. I know so much about the game, its environments, and its enemies, yet I still fear its surprises and challenges. I fear them, but I welcome them, too. Bring it on, Smoky Progg. Bring it on. To me, Pikmin is a unique game that pulls influences from many genres ranging from real-time strategy games to its contemporary and zany Nintendo games. The game engages the player with familiar scenery and a simple goal, but it offers fun and unexpected challenges at the same time. It creates an intrigue that compels players to explore and discover. Although the story itself isn’t very inspired, the consistent attention to detail offers the player an opportunity to explore a new world through the eyes of Olimar: a character with whom they can sympathize. It offers a new way to tell a story as both the player and avatar discover the world and grow together. In the end, I think we’ve successfully retrieved all of our ship parts by Day 30. Welcome to the video game canon, Pikmin! Matt McGill will be featured as a panelist in “Which Games Belong in the Video Game Canon?”, one of three panels With a Terrible Fate is offering at PAX East 2018. 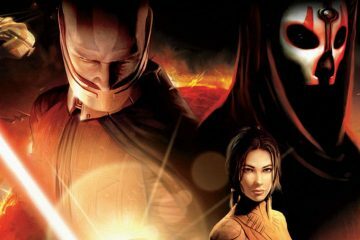 Don’t miss this chance to learn more about the series and join us in a live discussion about whether an audience-selected game belongs in the canon! Categories: Now Loading... The Video Game Canon! 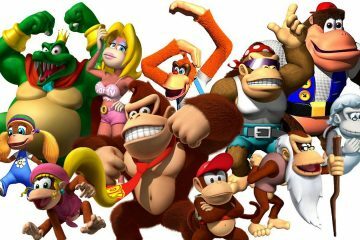 Does Donkey Kong 64 Belong in the Video Game Canon? Donkey Kong 64 combined everything from banana-inspired controllers to rap. How did it impact the storytelling of video games?